A Voice Auth transaction is most often used when a merchant attempts to process a transaction and receives an error code indicating the transaction requires voice authorization. When processing a Voice Auth, the merchant must contact the customer's issuing bank for an authorization code. To process a Voice Auth, go to ‘Transactions’ on the side menu bar then select ‘Voice Auth’ from the drop down menu. Manually enter the customer’s credit card information or swipe the customer’s credit card. When manually entering the customer’s credit card information, enter the Card Number, the card's Expiration Date, Authorization amount, and Authorization code provided by the customer's issuing bank. The Cardholder Name, AVS Street, AVS Zip Code, and CVV fields are all optional. To swipe a customer's credit card, click 'Swipe'. Once you click 'Swipe', the ‘Please Swipe’ window will appear. Swipe the card when prompted. Once you have swiped the card, the customer’s encrypted credit card information will auto-populate in the following fields: Cardholder Name, Card Number, and Expiration Date. To reveal additional fields (Company Name, Customer ID #, Invoice #, PO #, Order ID, and Description), click the drop down arrow on the top left side of the 'Customer Email' field. 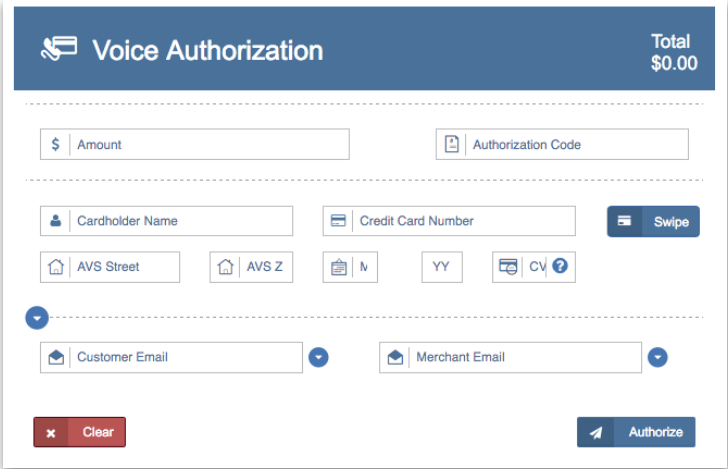 To email the Voice Auth receipt to your customer, enter the customer's email in the 'Customer Email' field. To send a report of the transaction to your email, enter your email in the 'Merchant Email' field. Once all desired fields have been entered, click 'Authorize'. A pop up window will appear with one of the three responses: 'Transaction Approved', 'Transaction Declined', or ‘Error'.